Home marionettes theater, children's puppet theatre toy. The portable puppets theatre includes 5 czech marionettes puppets and a number of sets. The theater is complete and ready for performance. If you wish, you may complete the theater with other puppets or sets from the range offered by our shop. In the complete set there are puppets for performance "Little Red Riding Hood", or "Little Red Ridinghood", also known as "Little Red Cap" or simply "Red Riding Hood", is a European fairy tale about a young girl and a Big Bad Wolf. There are puppets: Little Red Cap, Wolf, the grandmother, the Hunter, Joker. The theater measures 14"x10" . Size of marionette is 4" . An original puppets theater, handmade by a Czech artist. 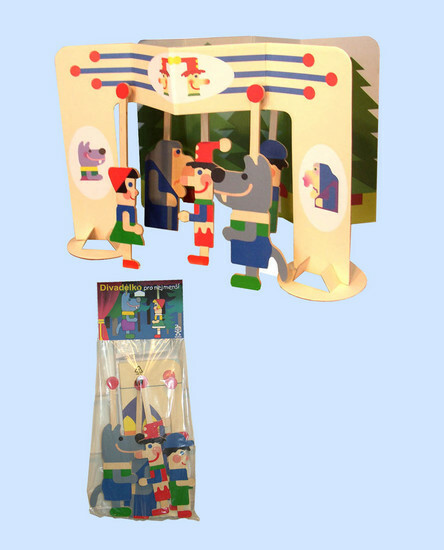 The little puppet theatre is used for playing in family as a educational toy for a child.